You are currently browsing articles tagged Puerto Nuevo lobster. I haven’t been to Puerto Nuevo, the little lobster village south of Tijuana, in ages. We used to go a few times a year, making the drive down to Tijuana to do a little shopping and then heading further south for dinner at Puerto Nuevo. To be honest, the food was never that great. It was good—but not great. 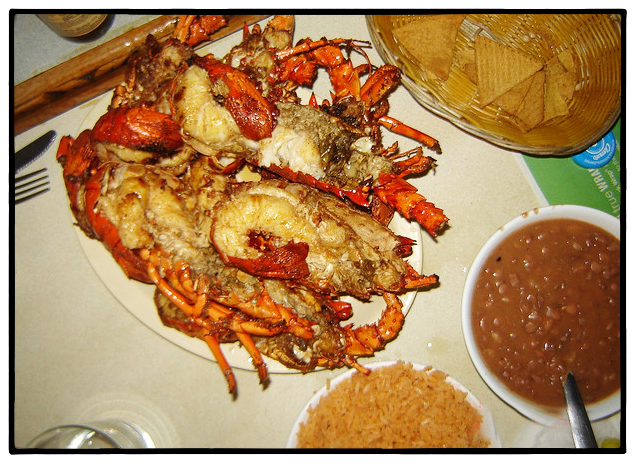 When I first started going to Puerto Nuevo, back in the late ‘80s, the lobsters were caught by the local fishermen. But then the dusty little village became a popular daytrip for half of California and the restaurant up and down the town’s two dirt roads couldn’t keep up with demand. The lobsters were frozen. And from the East Coast. But they were still pretty good. And relatively cheap. Maybe a dozen restaurants in town all serve the same thing: lobsters split in half and fried in lard with garlic, beans, rice, and tortillas. Simple. But, like any simple dish, some did it better than others. The trick is in the preparation; cook the lobsters too long, and they become rubbery and tasteless. Over the years I’ve developed my own Puerto Nuevo-style lobster. Which is to say, I take the basic idea (split lobsters served with Mexican beans, rice, and tortillas, and adapted it in a way that, I think, far excels the original. Here’s my recipe. For Chipotle Lime Butter: Heat butter over low heat and add garlic just long enough to release its aroma (about 2 minutes). Stir in sauce from chilis, lime juice, lime peel, and salt. Stir just until salt dissolves and everything is well mixed. Remove from heat. For lobsters: Bring a large pot of water to a fast boil and drop in two whole lobsters. Cook, covered, for three minutes. Remove lobsters to a cookie tray and put in next two lobsters (making sure water is again at a boil) and repeat process. Transfer lobsters to a cutting surface. Place face down. Place tip of large, sharp knife in the center of the lobster and cut lengthwise in half from center to end of head, then in the other direction from center through tail. Prepare barbecue (medium-high heat). Brush lobster halves with Chipotle Lime Butter and place halves, meat side up, on barbecue. Cook until just opaque in thickest portion of tail, about 7 to 9 minutes, basting with Chipotle Lime Butter. Serve with homemade pinto beans, Mexican rice, and warm tortillas.